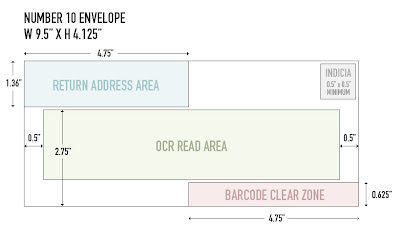 Finding specifications for such a common of a thing as a #10 envelope (normal letter size envelope) is harder than you think. I was able to track down the guidelines after visiting multiple sites and piecemealing the specs together to help me draw the guidelines you see above. Google was not good at finding relevant results either. As soon as you type in "envelope" you get thousands of results from printing vendors. Sorting though the results for the information I needed was taxing to say the least. So, I created this simple graphic to help anyone in their quest for number 10 envelope answers. A couple things to note: The Barcode Clear Zone is exactly that, a clear zone. No text or graphics can be in this 4.75" by 0.625" area. Also, in the OCR Read Area, OCR stands for Optical Character Recognition, a machine operated sorting process. Robots score another point against the humans. Nothing but essential addressee information should appear in this area. In addition, the US Postal Service has a website with all of it's guidelines, but the user interface and information architecture is down right atrocious. It's close to impossible to find anything especially if you don't speak "mail". Most everything has a specific term so nothing is easily searchable. 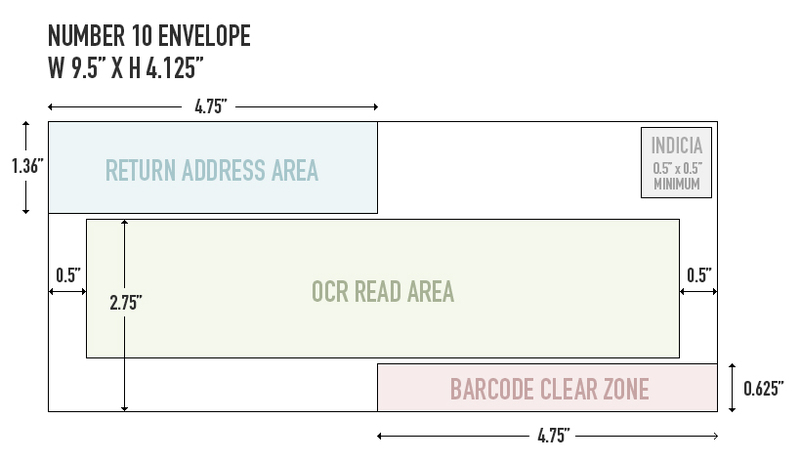 How would someone guess that this information is in the "DMM 102 Elements on the Face of a Mailpiece" page? Their "Postal Explorer" needs a much overdue major overhaul. Good luck to the people who take on that task. Lovely, post. Just what I needed. I am struggling with the OCR area. I think I may design there anyway and mail out some samples. I would love to repost/link this info on my blog with your permission. Fantastic post. And you're right about the lack of straightforward info in Google and on the USPS site. Thank you for this; hope your lesson ranks higher in Google results soon. Thanks for this. Just helped me out with a job just about to go to press. Couldn't find this simple info on the USPS site. Go figure. Thank you for sharing this! I agree the USPS site is not user friendly. I strongly believe this is an area they struggle in - informing the customer in simple terms of the regulations. So can I have design elements in the OCR Read area? Thanks for posting this!!! Super helpful.